Nasipit is the main port of Agusan after the Butuan ports (Butuan and Lumbocon) lost that status because the ships no longer came. That was because of the siltation of Agusan River and the general increase in the size and depths of the ships. Nasipit port is unique in topographic sense. It is located in a nearly enclosed bay which looks like a pond. Two enclosing spits of land nearly closes the outlet of the bay. As such Nasipit port is probably the most protected port in the Philippines. But it is deep enough that 160-meter ferries used to dock before in Nasipit. Those were great liners Princess of Paradise of Sulpicio Lines Inc. and the Our Lady of Akita of Carlos A. Gothong Lines Inc. which later became the SuperFerry 6 of WG&A. The very small Nasipit Bay was once the home of the famed Nasipit Lumber Inc. which used to produce veneer, plywood and other types of processed wood products. The plant of the company was once the original user of that bay and the bay also served as the stocking pond of their logs and their wharf inside the bay was where the cargo ships loading their products once docked. Nasipit port was built adjacent to Nasipit Lumber with the latter nearer the entrance of the bay. Nasipit Lumber has closed long ago when logs and lumber became scarce and new rules protecting the ancestral domain were drawn. Now that plant is even gone now including the buildings. What remained are some the concrete floors and just parts of their old wharf. Now the permanent resident of the bay is the power barge of Therma Marine Inc., an Aboitiz Power Corporation subsidiary and this is located in the inner part of the nearly-enclosed bay. Also in Nasipit Bay, inside the port is the Port Maritime Office (PMO) of the Philippine Ports Authority (PPA) which is in charge of all the ports in the Caraga Region. The manager of it and the employees wants it transferred to Butuan, however, because it is there that where most of them live. I don’t know if that will push through. Nasipit Bay is also home to swirling rains I have not observed anywhere else and maybe that is due to the peculiar topography of the Nasipit inlet which are surrounded by high hills in a particular way. Nasipit port is a straight quay where the middle it was broken by a slanted RORO ramp which is just a recent alteration. In the inner end smaller ships like tugs and Philippine Coast Guard (PCG) patrol boats are docked. There is a transit shed for cargo and a passenger waiting area in the port terminal building. Docking for big ships is a precise maneuver inside the Nasipit inlet as the bay is very small and there are shallow portions and it is especially dangerous when it is low tide. However, there are not s to contend unlike in the exposed ports. Nasipit port has been the port of passenger ships for a long time now not because it is convenient or near the city (it is actually out of the way and relatively far from the town and highway). The change happened in the 1970’s when the ports of Butuan became shallower because of siltation and there was lack of dredging (the results of which are often just undone by raging annual floods of the great Agusan River). By the 1980’s, Nasipit port has already supplanted the Butuan ports especially since the shallow-draft ex-”FS” ships were already dying from old age and the replacements of that type were already bigger. However, even though the ports have changed many passenger shipping companies still used the name “Butuan Port” when actually they were already docking and using Nasipit port and this entailed confusion to the uninitiated including land-bound researchers doing shipping studies. There were passenger vessels which did both the Butuan and Nasipit ports. They just gave up on Butuan port when docking there became much dependent on high tide (and risk waiting until noon at times when this would already jeopardize departure time because loading and unloading using booms and porters is slow). One example of this were the former “FS” ships of the Bisaya Land Transport Company of the Cuencos of Cebu (no typo there, that is the actual name of a shipping company which is a division of their land transport). When they find it impossible to dock in Butuan, they then proceed to Nasipit port (to the complain of many passengers). Compania Maritima, the leading shipping company after the Pacific War was one of the earliest to use Nasipit port. Their passenger-cargo ship Samar which is the bigger type of US war-surplus ship used to dock in Nasipit port. That was also true for their passenger-cargo ship Mactan which was in the 80-meter class and whose depth is two meters over the depth of an ex-”FS” ship, the last type of passenger ship that can be shoehorned in the shallow Butuan ports. Their Mindoro and Romblon, both converted ex-”FS” ship docked at both Butuan and Nasipit ports (and maybe that is to increase the passengers and cargo). Their Panay, a bigger ship docked at Nasipit when it can’t in Butuan. Later, even their ex-”FS” ship Leyte was calling exclusively in Nasipit port. Compania Maritima was the first to dominate Nasipit port when the Chinoy shipping companies were just on their way up and not calling on Nasipit port. In the main they came to Nasipit port when Compania Maritima was already gone. Some actually just gave up on the Agusan trade when their ships can no longer dock in Butuan and they did not really try to earnestly use Nasipit port like Escano Lines which used to be strong in Butuan. Well, it must have been frustrating for them when the ship can’t dock after a few hours of waiting and then would have to go to Nasipit port anyway to load and unload. Moreover, the floods of Agusan River that happen many months of the year with its floating logs and other debris which can damage the ship propellers and rudders also added to the vagaries in docking in Butuan. By the 1980’s the passenger ship calls on Nasipit, Butuan and Surigao which are all connected ports went down considerably. There was a big, general downturn in the economy because of economic crisis and container ships began supplanting the passenger-cargo ships in carrying cargo (where before this type carried a lot of the express cargo that are not in bulk or liquid). These new container ships cannot fit in the Butuan ports. However, few of them are coming in Butuan anyway. Another thing, the cargo ace of Nasipit before which were the forest products began slumping as the forest cover was fast going down and it raised a howl and therefore restrictions on logging were placed by the new Aquino administration. At the tail end of the Compania Maritima dominance a new liner was calling in Nasipit, the Surigao Princess of Sulpicio Lines which was a pocket liner. In the post-martial law period the Our Lady of Guadalupe of Carlos A. Gothong Lines, Inc. (CAGLI) came. And so these two liners succeeded Compania Maritima were gone as the company went out of business at the height of the political and economic crisis of the mid-1980’s. Soon, the better Our Lady of Lourdes of CAGLI replaced the Our Lady of Guadalupe in that route. In 1988, the big Nasipit Princess of Sulpicio Lines began calling in Nasipit port. But her route was mainly Cebu only as it was still Surigao Princess that was the liner there of Sulpicio Lines Inc. And, the Dona Lili of Gothong was also sailing from Nasipit to Cebu. It was Carlos A. Gothong Lines and Sulpicio Lines which were competing in Nasipit port in the 1990’s both in the liner route to Manila and the overnight route to Cebu. Although Nasipit was no longer as grand a destination like when Butuan still had a lot of ships calling, the two companies brought some great liners in Nasipit port like the Our Lady of Akita and the Princess of Paradise and what a show of confidence it was for Nasipit port. That was the heyday of competition when there was much optimism in business and the shipping liberalization and modernization policies of the administration of Fidel V. Ramos (FVR) took effect. A little before the “Great Merger” William Lines will also enter Nasipit port with their liner Mabuhay 2. When the Great Merger that produced the giant shipping company WG&A came there was a plethora of ever-changing ships that got assigned to Nasipit port unlike in the past when a ferry will hold a route for a decade or even longer. In WG&A, routes and route assignments happen at least once a year and so tracking of ships that served a port became difficult. However, Nasipit was a regular route of the company. That liberalization of FVR also brought the expanding Negros Navigation Company (NENACO) to Nasipit where they used their beautiful St. Francis of Assisi. Unfortunately, that liner burned right in Nasipit quay not long after in 1999 which resulted in the destruction of the ship. The revived Carlos A. Gothong Lines Inc. (CAGLI) also tried the Manila to Nasipit liner route before it just became a Cargo RORO route when they got suspended from passenger shipping. Nasipit still has lots of load, no longer forest products but bananas. With the “Great Merger” and the creation of Visayas-Mindanao subsidiary Cebu Ferries Corporation (CFC), that company also paraded a succession of ships in Nasipit port that is bound to Cebu on an overnight route. It began from the old Our Lady of Lourdes and it ended with Cebu Ferry 2 when CFC was already under the Aboitiz Transport System (ATS), the successor company of WG&A. Sulpicio Lines, their only competitor in the overnight route brought the Cagayan Princess in Nasipit when the Nasipit Princess can no longer sail. This was later followed by the much-better Princess of the Earth. And for a while, the Gothong Southern Shipping Lines Inc. (GSSLI) brought their Dona Rita Sr. to Nasipit port after they acquired the Our Lady of Good Voyage of Cebu Ferries. The port has also a link to Jagna port in Bohol as service to the Bol-anons residing in Mindanao. Usually the Cebu-Nasipit ship of a company will do a once a week call to Jagna on their seventh day and the ship will go back to Nasipit within that seventh day and then resume their route to Cebu. This decade saw a great downturn for Nasipit in sailing ships. There was only one liner left doing a once a week voyage to Manila and this was usually the St. Leo The Great of 2GO. Sulpicio Lines quit passenger sailing and Gothong Southern also gave up that segment. Even Cebu Ferries quit the Nasipit overnight route to Cebu when they transferred their ships to Batangas. Now, a completely new cast is in Nasipit port headed by Cokaliong Shipping Lines Inc. (CSLI) which use either their Filipinas Butuan or Filipinas Iligan in the Cebu to Nasipit overnight route with an off day diversion to Jagna. Lite Ferries also has a Nasipit to Jagna ship on the stronger months for sailing but there is no permanently assigned ship. 2GO still has that once a week liner from Manila. Nasipit is not a favorite of container ships except for Carlos A. Gothong Lines. Passenger shipping which is down already ia affected by the intermodal buses and the budget airlines, both of which offer competitive fares compared to ships and with the advantage of daily departures. Nasipit is also not helped by it being out of the way from the city and the municipality’s policy of barring the buses and commuter vans from the port doesn’t help the case of Nasipit port either in attracting passengers who are turned off the expensive and very cramped tricycle ride which is also vulnerable from the rains driven by the swirling winds of Nasipit inlet. I wonder when and how Nasipit port will have a renaissance. Somehow, some day, I just hope that it will come. If we adjust the standards a little for fast cruisers in the 1950’s at just below 18 knots then the first “Don Julio” of Ledesma Shipping Lines will qualify a fast cruiser liner. It should be because she was actually the fastest liner of her era! She was the fastest liner of the 1950’s when she was fielded in 1951 and that was true until she was sold to Southern Lines in 1959. The first “Don Julio” was an ex-”FS” ship but lengthened in Hongkong when converted to a passenger-cargo ship like many of her sister ships here. She was the fastest in her period because she was re-engined to higher ratings. Two former diesel engines from submarines which were Fairbanks-Morse diesels of a combined 3,600 horsepower were fitted to her and this gave her a speed of over 17 knots. She was the former “FS-286” built by Wheeler Shipbuilding Corp. in Brookly, Newy York USA. As lengthened her dimensions were 66.2 meters by 10.0 meters with a cubic measure of 1,051 gross register tons and she was the biggest former ex-”FS” ship that sailed in the country. Later, when she passed on to Philippine Pioneer Lines she was known as “Pioneer Leyte”. On October 23, 1966, she was involved in a collision in Manila Bay and she was subsequently broken up. The next fastest liner in Philippine waters came in 1960. She was formerly a seaplane tender named “Onslow” and built for the US Navy by Lake Washington Shipyard in Houghton, Washington, USA in 1943. Continuing service in the US Navy after the war she was known as “AVP-48”, a supply ship. Released from the US Navy, she was converted as a passenger-cargo ship. She measured 94.7 meters by 12.5 meters with a cubic volume of 2,137. This ship has two engines of 6,080 horsepower giving her a top speed of 18 knots. She was first known as “President Quezon” in the fleet of Philippine President Lines and later she was known as “Quezon”. When she was transferred to the fleet of Philippine Pioneer Lines she was known as “Pioneer Iloilo” and when she was sold to Galaxy Lines she became the flagship of the fleet by the name of “Galaxy”. She foundered at her moorings in Cebu while laid up on October 19, 1971. In 1968, the leading company then Compania Maritima ordered the liner “Filipinas” from Bremer Vulkan AG in Vegesack, Germany. This flagship has the dimensions 121.0 meters by 18.1 meters and her cubic measurement was 4,997 gross tons. She had a single Bremer Vulkan diesel engine of 8,800 horsepower which gave her a top speed of 18 knots. As a fast and modern cruiser liner, she was used by the company in the long-distance route to Davao via Cebu and Zamboanga, a very logical route for her. She served the company until Compania Maritima ceased sailing and she was sent to Taiwan ship breaker. She was demolished on April 5, 1985 after just 17 years of sailing. She was probably not purchased by other companies here because during that time it was already obvious that the period of the ROROs has arrived and she was a cruiser. In 1970, Compania Maritima acquired another cruiser liner, a second-hand one, the former “Hornkoog” of Horn-Linie GmbH. This ship was built by Deutsche Werft AG in Finkenwerder, Hamburg, Germany in 1959. She was renamed here as the second “Mindanao” and she was actually longer but thinner than the flagship “Filipinas” at 134.6 meters by 16.1 meters. She had the cubic volume 3,357 gross register tons. This liner was powered by a single diesel engine which gave her a top speed of 18 knots. It seems this fast cruiser liner was mainly used by Compania Maritima in their Far East routes where their name was Maritime Company of the Philippines. Incidentally, this ship was the last-ever liner acquired by Compania Maritima. This ship was broken up in Taiwan in 1980. After the first “Don Julio” from Ledesma Shipping Lines, the coalesced company of Ledesma Lines and Negros Navigation, with the latter as survivor, embarked on a series of orders of new fast cruiser liners which were actually all sister ships. This started with the “Dona Florentina” in 1965. She was built by Hitachi Zosen Corp. in Osaka, Japan and she measured 95.7 meters by 13.9 meters. This liner had a cubic measurement of 2,095 gross register tons and a passenger capacity of 831. She was fitted with a single Hitachi diesel engine with 4,400 horsepower and she had a top speed of 17.5 knots. Since this was still the 1960’s and it was just a shade under 18 knots I already qualify her as a fast cruiser liner. She had a fire while sailing on May 18, 1983 and she was beached on Batbatan Island in Culasi, Antique. She was later towed to Batangas where she was broken up on March 1985. The beautiful “Don Julio” followed “Dona Florentina” in 1967 and she became the flagship of the Negros Navigation fleet. She was built in Maizuru Shipyard in Maizuru, Japan and she had the same length and breadth of “Dona Florentina”. She was however a little bigger at 2,381 gross tons and she had a higher passenger capacity at 994. She had the same engine and the same horsepower as “Dona Florentina” and her speed was the same, too. This liner had a long career and she even became part of the transfer of Negros Navigation ships to Jensen Shipping of Cebu. She had her final lay-up sometime ins 2000’s and now her fate is uncertain. Her namesake congressman was however still looking for her several years ago, for preservation purposes. Most likely she is gone now. In 1971, Negros Navigation rolled out a new flagship, a sister ship to “Dona Florentina” and “Don Julio” but with a bigger engine and a higher top speed. This was the “Don Juan” with the same length and breadth as the two but fitted with 5,000-horsepower B&W engine which gave her a top speed of 19 knots. Her cubic measure was 2,310 gross register tons and she had a passenger capacity of only 740 because she had more amenities. She was built by Niigata Shipbuilding & Repair in Niigata, Japan. This fast cruiser liner did not sail long because on the night of April 22, 1980, she was hit by tanker “Tacloban City” on her port side while cruising in Tablas Strait at night. She went down quickly with a claimed 1,000 number of lives lost. She was reckoned to be overloaded at that time. In 1976, Negros Navigation procured a second-hand fast cruiser liner, the “Don Claudio”. During that time, because of the fast devaluation Philippine shipping companies can no longer afford to acquire new liners. This ship was the former “Okinoshima Maru” of Kansai Kisen KK. She was built in 1966 by Sanoyas Shoji Company in Osaka, Japan. Her dimensions were 92.6 meters by 14.4 meters and her cubic dimensions was 2,721 gross tons. Originally, her passenger capacity was 895. She was equipped with a 3,850-horsepower Mitsui-B&W engine that gave her a top speed of 18.5 knots. All the fast cruiser liners of Negros Navigation were mainly used in the short routes to Bacolod and Iloilo. Later, some were assigned a route to Roxas City, another short route. The last shipping company to have a fast cruiser liner was Sweet Lines. She purchased the “H.P. Prior” from Det Forenede in Denmark in 1970 and when they fielded this they ruled the Manila-Cebu route. She was the legendary and first “Sweet Faith” which later battled in that route the equally-legendary “Cebu City” of William Lines. “Sweet Faith” was built by Helsingor Vaertft in Elsinore, Denmark in 1950. She measured 104.0 meters by 14.9 meters and 3,155 gross register tons as cubic measure. This fast cruiser was equipped by two Helsingor Vaerft diesel engines with a total of 7,620 horsepower which provided her a top speed of 20 knots sustained. She was actually the first liner in the inter-island route capable of 20 knots, a magic threshold. She only sailed for ten years here and in 1980 she was broken up in Cebu. Sweet Lines had another liner capable of sailing at 18 knots when she was still new. This was the former “Caralis” of Tirrenea Spa di Navale of Italy which was built by Navalmeccanica in Castellamare, Italy. She was the second “Sweet Home” of Sweet Lines and she measured 120.4 meters by 16.0 meters and 5,489 gross register tons in cubic capacity and she can carry 1,200 persons. Sweet Lines advertised her and the “Sweet Faith” as the “Inimitable Pair” and the two were paired in the premier Manila-Cebu route. Sweet Lines sold her in 1978 and she became a floating hotel. She capsized and sank while laid up in Manila on November 24, 1981. She was subsequently broken up. These were the eight other fast cruiser liners that came to the Philippines which were not part of the fleet of William Lines and Sulpicio Lines in which I had an earlier article. In 1957, President Carlos P. Garcia ascended to Malacanang after the death of President Ramon Magsaysay and thereafter he won the Philippine presidency in his own right. While President Magsaysay worked very closely with the Americans and relied on them for the economic development of the country, President Garcia rolled out his “Filipino First” policy. Under that policy, he tried to promote Philippine industries and supported Filipino industrialists, to the consternation of some Americans used to having their way in the country, given first preference and who treated Filipinos like their wards. Among the industries President Garcia tried to push forward was shipbuilding (shipbuilding is selling steel too and on the same track President Garcia encouraged steel-making which resulted in the establishment of IISMI or Iligan Integrated Steel Mills Inc. which later became the National Steel Corporation or NSC). That made sense, at least on paper, as our country is an archipelago and hence we need a lot of ships. From an enterprise concerned with refitting and lengthening of ships (where before this was done in Hongkong), NASSCO (National Shipyards & Steel Corporation) went into shipbuilding and Hull No. 1 was laid in the NASSCO shipyard (the Bataan National Shipyard) in Mariveles, Bataan in 1957. Lacking the experience and equipment maybe, the ship took too long to complete. Well, we are a country where engineering is still in infancy. We are not a country where work is fast and based on a production line and our craftsmen are not used to mass production. That is what we get by being proud of our jeepneys and our talyers. Yes, it can fabricate anything but the speed and quality is low. Essentially, we are a country of fabricators. Maybe there was a problem of timing and priority too. In the time Hull No. 1 was under construction it was also the same time that reparations ships were beginning to come to the Philippines because the final peace treaty between Japan and her victim countries was already signed. Reparations ships came from the reparations payment of Japan as settlement of the damages she inflicted because of the war she launched in the Pacific in 1941 (but it was just basically payment for public works and infrastructure damage and did not include personal damages which were never paid by Japan unlike Germany). Hull No. 1 was financed by a loan from the government-owned Development Bank of the Philippines to the tune of P2.5 million or a little over $ 1 million dollars then. Hull No. 1 was launched on July 1959 and completed as a passenger-cargo ship in May 1960 and she became the ship General Roxas of the General Shipping Company. This company previously just operated a fleet of former “FS” ships before which were cargo ships converted into passenger-cargo use. The General Roxas was way ahead in size, quality and comfort compared to the ex-”FS” ships and she was probably the flagship of General Shipping Company which operated routes to Palawan, Romblon, Masbate, Bicol, the Visayas and Northern Mindanao. The General Roxas’ external measurements were 84.7 meters by 12.3 meters by 6.7 meters in L x B x D with a Gross Register Tonnage (GRT) of 1,757 tons. Her Net Register Tonnage (NRT) was 968 and her load capacity in Deadweight Tonnage (DWT) was 1,544 tons. The ship was equipped by a single Uraga engine of 2,200 horsepower which gave her a top sustained speed of 13.5 knots when still new. The General Roxas has two sister ships built also by NASSCO and these were the General del Pilar (later the Mactan of Compania Maritima) and the Governor B. Lopez of Southern Lines Incorporated. The latter was built in the same yard and almost simultaneously with General Roxas. The General Roxas’ hull steel, engine and navigational equipment all came from Japan. The ship had air-conditioning and in those days it was practically what defined what is a luxury liner. Her First Class accommodations, lounges and dining rooms were all air-conditioned. This ship had three passenger decks and for handling cargo she had booms in the front section or bow of the ship. Cargo was stowed below the passenger decks and above and on the engine deck. The ship is a cruiser ship (it was not yet the time of the ROROs which can load vehicles through ramps) with a high prow. The ship later was assigned the IMO Number 5128015. In General Shipping Company, she was the second General Roxas as the company had an earlier ship named General Roxas too and that was a former “FS” ship (and that is the beauty of IMO Numbers as it can differentiate ships with the same names). In General Shipping Corporation the first route of General Roxas was Manila-Iloilo-Pulupandan-Iligan. Iligan then was beginning to boom because of the Maria Cristina power plant which provided cheap hydroelectric power and Iloilo and Pulupandan ports served two big and progressive islands. But despite two new passenger-cargo ships and a healthy fleet, in 1965, after a boardroom dispute General Shipping Company abandoned inter-island shipping and moved into international shipping. Their local fleet and routes were then divided between Aboitiz Shipping Corporation and the former regional shipping company Sweet Lines Incorporated which then became a national liner company (however, the new ship General del Pilar became the Mactan of Compania Maritima). Among the ships acquired by Sweet Lines was the General Roxas which became the Sweet Rose in the new company. In the new liner fleet of Sweet Lines (to distinguish it from the regional fleet of Sweet Lines which mainly had the small ex-”F” ships), the Sweet Rose was the biggest and best ship. However, the tactic then of Sweet Lines was to field their ships not on the primary routes and so Sweet Rose was assigned the Manila-Catbalogan-Tacloban-Cebu, v.v. route. Right after fielding Sweet Rose was the newest, the best and fastest ship in the route that only had ex-”FS” ships before and this helped stabilize the company in the national routes for she then dominated that route. The ship’s next route was Manila-Cebu-Iligan-Ozamis route when the Sweet Grace, a brand-new ship from West Germany arrived. That only confirmed that the Manila-Catbalogan-Tacloban-Cebu, v.v. route was the primary route of Sweet Lines before the arrival of the fast cruiser liner Sweet Faith in 1970 and Sweet Rose was the flagship of the company before 1968 when Sweet Grace came. In the early 1970’s, the Sweet Rose was returned to the Manila-Catbalogan-Tacloban-Cebu, v.v. route in a pairing with the Sweet Grace. That indicated the level of importance Sweet Lines assigned to the route which was not high in the priority of other shipping companies (well, before William Lines entered the route with their fast cruiser liner Tacloban City in 1975) and that jeopardized a bread and butter route for Sweet Lines as the Tacloban City was a faster and superior ship. The Sweet Rose stayed on the route though but she now called in Masbate instead of Catbalogan leaving Sweet Grace to serve that port. However, she was assigned again the Manila-Catbalogan-Tacloban route after Sweet Lines invaded Mindanao routes outside Northern Mindanao and Sweet Grace did the Manila-Cebu-Zamboanga route. Sweet Rose never left the Catbalogan/Tacloban route again but in the 1980’s she began having unreliability in her engine and this trouble even reached the authorities. Engines of her period were not really that tough and she had the bad luck of having been equipped with an Uraga engine which was not a top of the line Japanese engine. She too had difficulty coping with Tacloban City and the Dona Angelina, the ship used by Sulpicio Lines when it entered the Catbalogan/Tacloban route just before Tacloban City came. The Dona Angelina which came from Europe also had air-conditioning like the Tacloban City. As a footnote, Sweet Rose also went up against her sister ship in the route when the Mactan was fielded there by Compania Maritima. That was before Mactan sank in 1973. In the great political and economic crisis that started with the Aquino assassination in 1983, Sweet Lines culled old liners and the Sweet Rose was among them. Others were the former European ships Sweet Bliss, Sweet Life and Sweet Love, ships they used in the Davao route via the eastern seaboard of Mindanao. That also included Sweet Sound which was a former “FS” ship. It was no dishonor to Sweet Lines because a lot a ships were cut up in this period when the industrial economy shrank and many shipping companies collapsed or shut down like the former No. 1 Compania Maritima. Sweet Lines was broken up just locally in Acuario Marketing, a local ship-breaking specialist in Navotas in 1984. She was just 24 years old then but actually she was able to outlast her two sister ships. Maybe she was not just good enough for a 30-year service like the former ships from Europe and Japan (the Tacloban City which was built in 1962 lasted until the late 1990’s but then she has the better Mitsubishi engine). The Dona Angelina also lasted over 30 years of sailing. Sweet Rose is a distant memory now but she holds a record that won’t ever be broken and that is being the first liner ever built in the country after World War II. She was also one of the ships that brought Sweet Lines to her peak in the late 1970’s. William Lines, one the greatest of Philippine shipping companies rose to probably become the country’s Number 1 entering the 1980’s. That rise to paramount position was fueled by their race with Sulpicio Lines to acquire fast cruiser liners from the Misamis Occidental to Cebu City, Tacloban City, Manila City, Cagayan de Oro City and Ozamis City. When they acquired the last-mentioned ship in 1978, they might have been in parity already with the erstwhile Number 1 which was Compania Maritima. 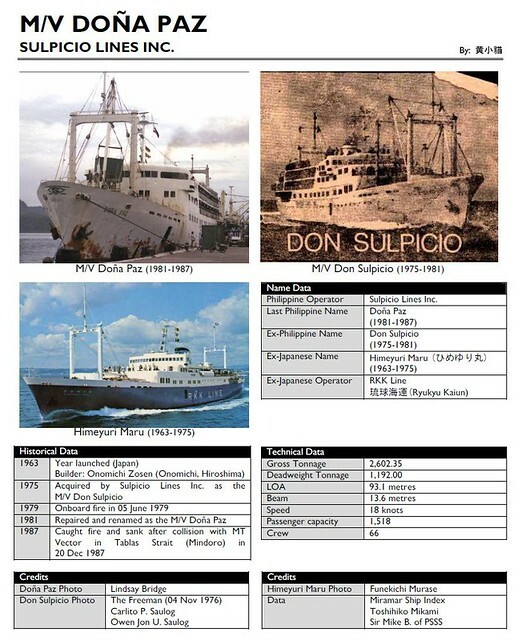 But when they acquired the half-RORO, half-cruiser Dona Virginia in 1979 and they joined the race with Aboitiz Shipping and Sulpicio Lines to acquire container ships starting in 1979 with the ROLO Cargo ship Wilcon 1, few will dispute that they were already Number 1 in our seas. That rise was aided by the non-purchase anymore of further ships by Compania Maritima (and the consecutive losses of ships of the company due to maritime accidents) and the split of the old Carlos A. Gothong & Company in 1972 which produced three separate shipping companies — Sulpicio Lines Incorporated, Lorenzo Shipping Corporation and Carlos A. Gothong Lines, Incorporated (CAGLI). However, while William Lines was mainly Number 1 in the next decade, the company seemed to overly rely on the fast cruiser lines (of which they had the most among the local shipping companies) and were relatively late in the acquisition of RORO liners. 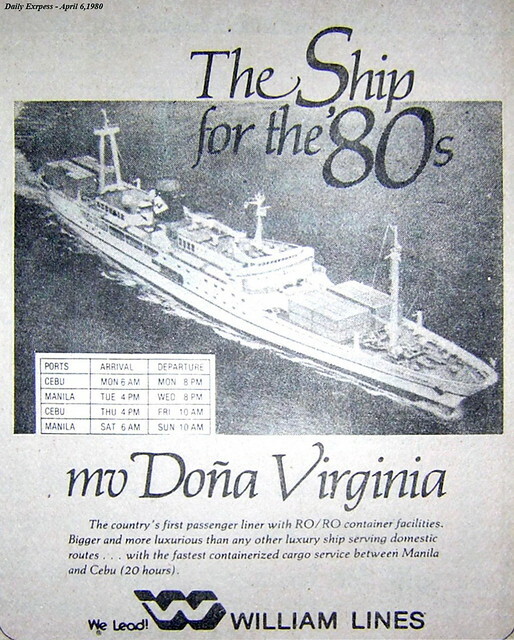 After the half-RORO, half-cruiser Dona Virginia, their first acquisition of a full-pledged RORO liner happened in 1987 already when they bought the Masbate I. By the time they acquired that, their main rival Sulpicio Lines has already purchased 4 ROROs and Carlos A. Gothong Lines even more. Sweet Lines had already procured 3 ROROs and and will add two more in 1987 and Negros Navigation has already bought 2. Among the still existent major liner companies, it was only Aboitiz Shipping and Escano Lines which had a zero total liners until 1987. So when Sulpicio Lines acquired 3 big ROROs in 1988, the Filipina Princess, Cotabato Princess and Nasipit Princess, William Lines lost their Number 1 position in the totem pole of local shipping and again few would dispute that. William Lines might have seen the handwriting on the wall that the cruiser liners were heading to obsolescence but what I don’t understand was their continued reliance on Arimura Sangyo, the later A” Lines on second-hand liners. To get their RORO liners, Sulpicio Lines did not rely anymore on their old supplier, the RKK Lines and instead diversified their sourcing. In fact, none of the three liners they purchased in 1988 came from RKK Lines and that itself is telling like they really want ROROs fast. William Lines tried to pursue Sulpicio Lines in the acquisition battle of RORO liners by purchasing their second full-pledged RORO liner in 1989. Just the same their supplier was still A” Lines and what they got was the Ferry Amami (actually many of their further purchases of liners will still come from this company like the Sugbu which was the latter Mabuhay 3, the Maynilad, Mabuhay 2, Mabuhay 6 and what was supposed to be the Mabuhay 7 which turned out to be the SuperFerry 11 and later Our Lady of Banneux). 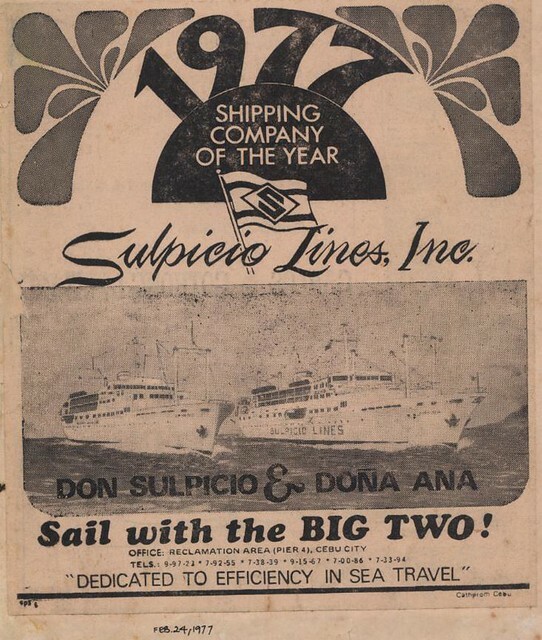 It seems it was the over-reliance of William Lines on A” Lines that doomed her into sliding into the Number 2 position among the local shipping companies and so Sulpicio Lines did well in diversifying their source. The Ferry Amami turned out into the ferry Zamboanga City, a ROPAX liner. This ferry was not known by many because she was not a ship with a route to Cebu and instead served her namesake city at first, obviously, and Cebuanos, the most literate among Pinoys about ships normally don’t go to Zamboanga City. This ferry, like many of the ferries of A” Line in the 1970’s had the design of having a stern ramp but having booms in the bow of the ship which is being hybrid also in some way. Most ROROs that came in this country does not have this design. It might have not been so fit here because the other ferries from A” Lines of William Lines had this boom subsequently removed like in Sugbu, Maynilad, Mabuhay 2, Mabuhay 6 and SuperFerry 11 (the later Our Lady of Banneux). When this boom is being operated, the ship also rocks in cargo loading like in cruiser ships and of course the stern ramp will also move and I think that was the contradiction of this kind of design. The Zamboanga City is not a big RORO liner but it is comparable to most of the RORO liners that came to the Philippines in the period between 1987 and 1992 which were near 100 meters in length up to a little over 120 meters in length. Among that came in this period were the Our Lady of Fatima, Our Lady of Lourdes, Our Lady of Sacred Heart, Sto. Nino de Cebu (the later Our Lady of Medjugorje) of Carlos A. Gothong Lines, the Masbate I, the Tacloban Princess and Manila Princess of Sulpicio Lines, the Sta. Ana and Princess of Negros of Negros Navigation. To this the Our Lady of the Rule of Carlos A. Gothong Lines can be added but she was not used in a Manila route. The notable exceptions were the 3 big liners that came to Sulpicio Lines in 1988 and the Sugbu, Maynilad, Mabuhay 1, Mabuhay 2 of William Lines and the SuperFerry 1 and SuperFerry 2 of Aboitiz Shipping. However, these small RORO liners of 1987-1992 had passenger capacity from over 1,200 to just over 2,000 and the Zamboanga City itself has a passenger capacity of 1,875. It was the period when the country’s economy was recovering, there was a shortage of liners and ferries in general because of lack of acquisitions in the previous years because of the economic crisis and former surplus World War II ships were already being retired. That was the reason why shipping companies tended to push to the limit the passenger capacities of their ships. And it can get full in the peak season and passengers have to be turned away (I have seen this personally many times). The Zamboanga City was built by Niigata Shipbuilding & Repair in 1975 in Niigata, Japan as the Emerald Amami of and she had the IMO Number 7435527. The ship’s external dimensions were 117.1 meters in length over-all (LOA), a length between perpendicular (LPP) of 105.0 meters and a beam of 19.0 meters and gross cubic measurements was 4,188 in gross register tonnage (GRT). The ferry originally had two and a half passenger decks and its route was to Amami Oshima in Japan. Emerald Amami had a quarter stern ramp leading to its car deck. The ship already has a bulbous stem which was still a novel design in 1975 and that feature aids the speed of the ship. The big cargo boom dominates the front of the ship. Emerald Amami was equipped with twin Niigata engines with a total horsepower of 16,800 which were the same engines powering the bigger Akatsuki of A” Line also (the Akatsuki became the Maynilad of the same company). With that powerplant, the Emerald Amami had an original sustained top speed of 20 knots (and the Akatsuki 18 knots because it is bigger). It was an unfortunate choice of engines as the Maynilad was only able to generate 15 knots here (because a lot of metal was added) and the Zamboanga City 17 knots (and William Lines suffered in the process). And because of the two, my respect for Niigata engines went down because the other ships of the size of Emerald Amami here can produce the same speed with just about 10,000 horsepower (like the SuperFerry 3, San Paolo and Princess of Negros). And ships of the size of Akatsuki with that engine horsepower can do much better speeds (like the SuperFerry 2 and SuperFerry 5). In 1987 Emerald Amami was renamed to Ferry Amami. In 1988, when the new Ferry Amami arrived she was put up for sale and in the next year she came to the Philippines for William Lines which then refitted her for Philippine conditions and that means adding decks to increase passenger capacity and to provide for open-air Economy accommodations (the added decks in her were what became the Economy sections). With that the gross tonnage of the ship increased to 5,747 with a net tonnage of 1,176 which is an understated figure (was this the net register tonnage in Japan?). It does not even meet the International Maritime Organization (IMO) requirement that the net tonnage should be at least one-third of the gross tonnage. The deadweight tonnage of the ship meanwhile remained at 2,082. The Call Sign of Zamboanga Ferry was DUZI. This Zamboanga City was the third ship to carry that name in the fleet of William Lines (and at other times she was only referred to as Zamboanga). 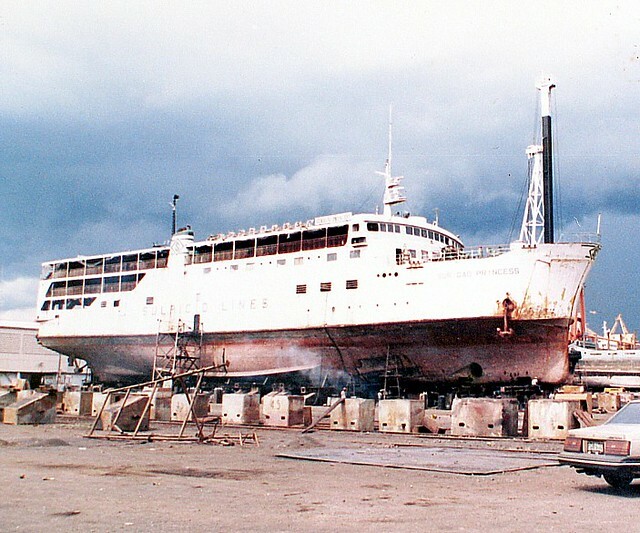 Zamboanga City became the replacement ship for the burned Manila City of William Lines in 1991 and thus held the Manila-Zamboanga-Davao route. She was also tried in the Manila-Iloilo-Zamboanga-Cotabato route later to challenge the Cotabato Princess there when Sulpicio Lines transferred the Filipina Princess to the Davao route and the Maynilad was used by William Lines in that route in 1992. When the Mabuhay liner series started arriving for William Lines, the Zamboanga City was shunted to the Manila-Puerto Princesa route without passing Coron and that was her route until William Lines coalesced with Gothong Lines and Aboitiz Shipping at the end of 1995 to form the super-company WG&A. In WG&A among the ROROs it was Zamboanga City which was subjected to ignominy. She was assigned the route Manila-Zamboanga-General Santos City early in 1996, a route where her relative lack of speed will show. At this time she was only capable of 16 knots when Maynilad was just capable of 14 knots. Her competitor there was the Princess of the Pacific of Sulpicio Lines which can do 18 knots. In mid-1996 she was assigned the Manila-Dipolog (actually Dapitan)-Ozamis route that was held before by another slowpoke, the 16-knot Our Lady of Good Voyage, the former Ferry Kikai of A” Line which first became the Mabuhay 6 (I noticed a lot of former A” Line ships that came to William Lines this period was afflicted with slow speed). In 1997 Zamboanga City disappeared from the schedules and she was offered for sale together with the Maynilad. The two were the only RORO liners offered for sale by WG&A. The Maynilad I can understand the reason because there is really no liner that just runs at 14 knots and passengers to Zamboanga when she was still with William Lines complained of the too long transit time even though she does not dock at Iloilo port. But at 16 knots the Zamboanga City was just in the league of SuperFerry 3, the Our Lady of Sacred Heart and just marginally below the Our Lady of Medjugorje. When WG&A started pairing of ships on routes, the three were often paired. All were mechanically reliable just like Zamboanga City but Zamboanga City was always left out. What was her jinx, the cargo boom at the front? Ferry Kikai also had that also but was removed and a deck ahead of the bridge, a Tourist accommodation was created. If that was the problem that could have been done also for Zamboanga City. Or was the 16,800 horsepower engine the real killer that was why she was disliked by WG&A Jebsens that manages the fleet? At least Our Lady of Good Voyage only has 7,600hp engines, the Our Lady of Sacred Heart had 8,000hp engine, the Our Lady of Medjugorje had 9,000hp engines and SuperFerry 3 just had 9,300hp engines. And their speeds were the same. Do the math. I was wondering then why the cruiser Our Lady of Naju which has the length of 111.4 meters was retained. Its cargo capacity was measly but her route of Dumaguit and Roxas City had minimal cargo anyway and so maybe her 10,000hp engines is what made her acceptable and she was even marginally faster than Zamboanga City. But why the Our Lady of Lipa with 18,800hp engines on 124.2 meters length survived? Well she at least had the speed and she could be used for the speed wars in Cebu-Cagayan de Oro route if needed. Maybe it was really the big engines with no speed that was the albatross on the neck of Zamboanga City. Now maybe if only Dumaguit and Roxas had more cargo then she might have survived instead of the Our Lady of Naju. Mind you the accommodations of Zamboanga City are decent and comparable to liners of her period and I can say that because I have ridden her when she was substituted to the Iligan route. I don’t know maybe that was just her role then in WG&A before she was sold – to be a reserve ship. Maybe her size and engine size was really not fit for the Visayas-Mindanao route. Or maybe WG&A prefered the Maynilad there (also known as Our Lady of Akita 2 after one passenger deck was removed). This ferry had better accommodations and bigger cargo capacity and 14 knots can be hidden in a Cebu to northern Mindanao route). Otherwise, she would have taken the slot of the 104.6-meter Our Lady of Manaoag, the former Masbate I. But then that ship only had small engines with 7,600 horsepower. An unwanted ship, in 2000 the Zamboanga City was finally sold to China breakers. Too unknown, too unheralded that few remember her.